Musings of a Furniture Maker: The NHL Suffers From Poor Design - Again !!! Anyone who follows NHL hockey will by now be familiar with "Chara incident" the other night, when Boston defenceman Zdeno Chara pushed/didn't push Max Pacioretty into one of the glass stanchions that surrounds the ice surface. This incident has triggered a flurry of debate over whether the act was deliberate or accidental, and whether or not Chara should receive additional punishment or suspension. In my opinion all this focus of attention on Chara and his "history" with Pacioretty is missing the real issue; namely, why are these rigid stanchions placed so close to the ice surface in the first place? It goes without saying that professional hockey is a very fast and aggressive sport that involves players zooming around the ice at high rates of speed. Sooner or later high speed collisions and serious injuries are bound to happen - even without the stanchions. What astounds me is that these rigid steel poles are positioned right at the very edge of the playing surface, where collisions of this type are all but inevitable. Without question this is a case of extremely poor design on the part of the NHL. How difficult would it be to place an angled glass surface as a transition piece into that corner? Should a player ever collide with that angled surface he'd be deflected back towards the playing surface instead of being slammed to a sudden stop. This isn't the first time that professional players have suffered because of poor design on the part of the NHL. 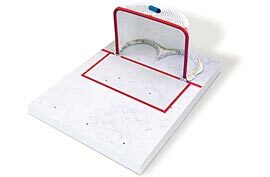 Back in 1980 a star player by the name of Mark Howe suffered a grotesque injury when he was impaled on the steel center rib on one of these old style NHL nets. Similar effort should be put into the redesign of the stanchions. I have posted one suggestion for a redesign here. Changing these things is going to be a lot easier than getting the Maple Leafs to win the Stanley Cup again.